Experience directly related to primary assignment will include: teaching for those employed as instructors, counselling when employed as a counsellor, all librarian assignments for those employed as librarians, and all experience as a technician for those employed as technicians. Research at the post-Doctoral level, and/or senior administrative experience in the field of hire or in the public education sector will be included as experience directly related to primary assignment. 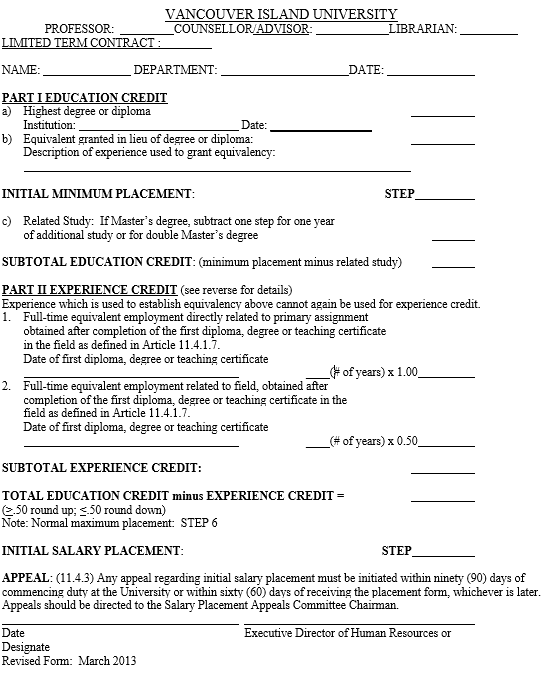 Teaching assistantships or other similar teaching assignments done while working on a Master’s or PhD will not be given extra credit unless the teaching assignment constitutes a full-time workload. Part-time teaching experience will be pro-rated based on a two-semester teaching year. Other part-time work experience will be pro-rated based on a 35 hour work week and 12-month year. In no event shall more than one year experience credit be granted for experience in any 12-month period. Teaching of non-credit courses is not included. The decimal fraction of a year’s experience leading to initial salary placement will not be carried forward to salary incremental progression. Only credentials from accredited institutions will be recognized when awarding initial minimum placement and for incremental progression based on completion of Master’s or Doctorate degrees. The decision of the Salaries Placement Appeals Committee is final.